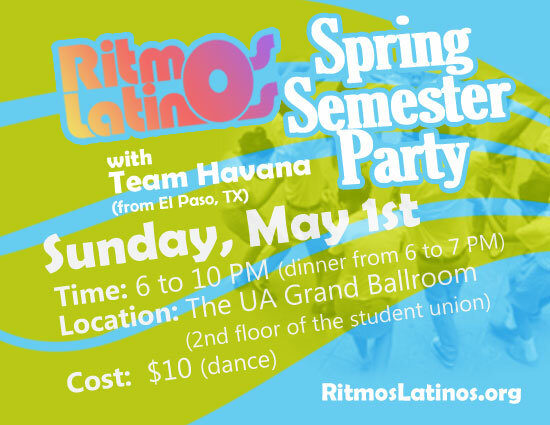 Get ready to celebrate at the Ritmos Latinos End of the Semester Party!! Come enjoy dinner and performances! This is a great opportunity to show off your skills, get a preview of what you could learn next semester and of course, dance some salsa! Dinner begins at 5:00 pm and dancing begins around 6:00 pm. Combo Unico will be providing the wonderful music for us to dance to the entire night! Hope to see you there y que viva la salsa!!!! Ritmos Latinos Classes for Spring 2013!! Summer is winding down but Salsa is heating up!!! Its time to show off those moves at the End of the Summer Fiesta!! Please RSVP by SUNDAY July 22. The Ritmos Latinos Summer 2012 session starts this week! Visit www.ritmoslatinos.org for schedule and registration form. Ritmos Latinos End-of-Semester Party with Manteca! Ritmos Latinos End of the Semester Party!!! with live music from Grupo Manteca! !